USA Employment Update and Consumer Analysis – NICE! Consumers are the ultimate driver of an Economy, especially the US economy. By most estimates, the consumer and his/her spending makes up over 66% of the US GDP (Gross Domestic Production) a broad measure of economic health. 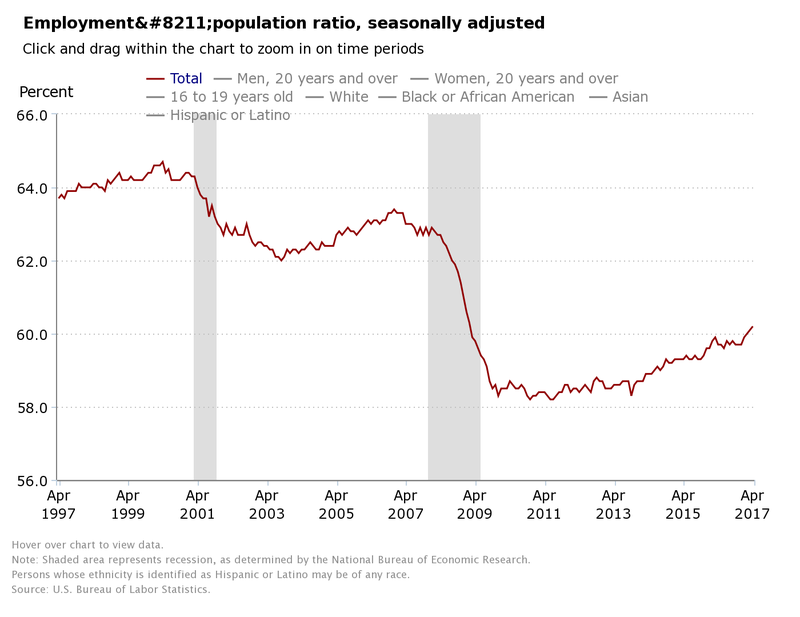 Here is an interesting analysis of the Bureau Of Labor Statistics (BLS) most recent monthly Employment Report … mentioned on our “Break In” of our Friday post. The highest, most blunt view of employment is the Unemployment rate, usually figured in % total unemployed. 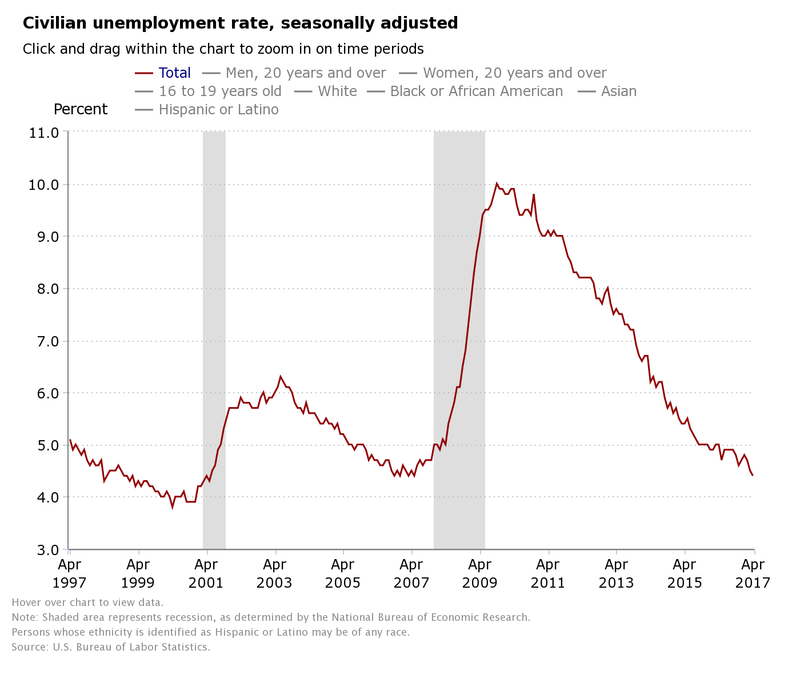 At 4.4%, the unemployment rate has fallen to a rate many, including ourselves thought maybe possible via post great recession! The little Economy Engine that could! Confident enough to walk away from the job? Sure looks like it. Said another way, individuals have enough confidence in finding a new job, they are not afraid to walk from their current one. 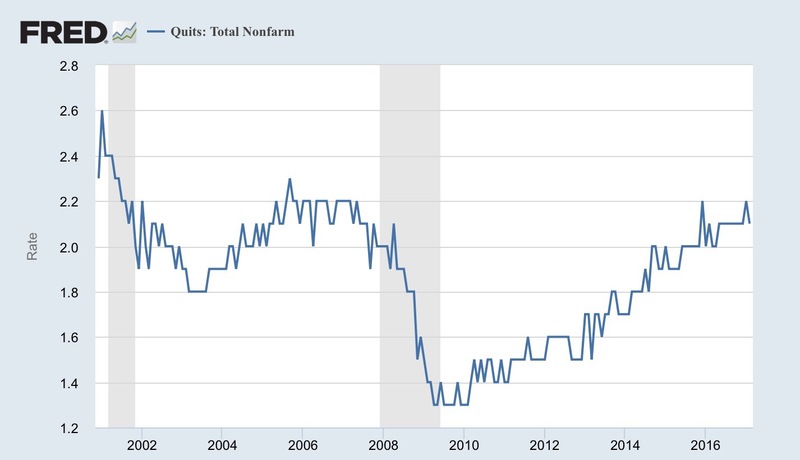 Brought to the attention of many by our current Federal Reserve Chairwoman, Janet Yellen, the job opening report also known as JOLTS report is showing clear evidence of job opportunities. Certainly the Great Recession has had lingering effects. Focusing on the move upward since 2009, one can see the line heading in the correct direction, possibly giving confidence to those above who are leaving their current job. Bottom line, a more confident, job opportunistic consumer economy! Full Circle Now- Higher Spending? Higher GDP? Going back to our original statement, with so much tailwind for the consumer coming from the employment of the US Economy, it would not be a stretch to think higher spending is in the cards, and a better GDP! Have a Great “Healthy Consumer Economy” Monday! This entry was posted in Economy, Investing/Financial Planning, Market Comments and tagged BLS, Employment, JOLTS, Quit rate, Unemployment Rate, Unemployment Report. Bookmark the permalink.